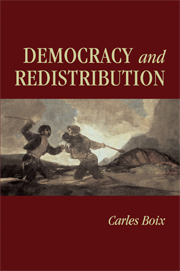 Employing analytical tools borrowed from game theory, Carles Boix offers a complete theory of political transitions. It is one in which political regimes ultimately depend on the nature of economic assets, their distribution among individuals, and the balance of power among different social groups. Backed by detailed historical research and extensive statistical analysis from the mid-nineteenth century, the study reveals why democracy emerged in classical Athens. It also covers the early triumph of democracy in nineteenth-century agrarian Norway, Switzerland and northeastern America as well as its failure in countries with a powerful landowning class. Introduction; 1. A theory of political transitions; 2. Empirical evidence; 3. Historical evidence; 4. Theoretical extensions: a. Growth, trade, and democracy; b. Political institutions; 5. Democracy and the public sector; 6. The state, the threat of expropriation, and the possibility of development; 7. Conclusions.